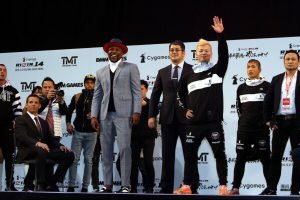 Floyd Mayweather Jr. has taken the surprising move to go to Japan to face Japanese Kickboxing Prodigy Tenshin Nasukawa in a special three round exhibition bout. Unfortunately for American fight fans, this event was not available in the United States. Mayweather was late to arriving at the Saitama Super Arena in Saitama, Japan and the co-main event and main event of the Rizin card was delayed until his arrival. The walk ins for Mayweather and Tenshin finally happened around 9:00AM EST in the United States and both boxers waited in the ring as both the Japanese and American National Anthems were sung. The size difference was readily apparent between the two as Mayweather was the taller, bigger, and longer boxer. Tenshin Nasukawa has an impressive combat sports record of 32-0. Mayweather’s boxing record stands at 50-0. This bout did not count on their official records. The opening round starts off with Nasukawa circling towards the left jab of Mayweather, who had a gigantic smile on his face and was slowly walking Nasukawa down. Nasukawa lands a straight left on Mayweather after Mayweather misses a straight right. Mayweather landed a good body shot and a left hook and Nasukawa goes to the mat. He gets up by the count of five. Mayweather is just too big, quick, and strong for Nasukawa. Mayweather lands another left hook that sends Nasukawa off balance. Mayweather lands a right uppercut on Nasukawa who goes to the mat again. Nasukawa gets up and looks hurt and wobbly. Nasukawa is firing bombs at Mayweather but gets knocked down for the third time in this fight. Nasukawa’s corner throws in the towel before he can take any more damage. Floyd Mayweather made short work of Nasukawa in this exhibition bout.